The last part of the year has seen even more UK clients transform their businesses with Influential Software. Our new clients in Q4, 2018 included local government, global manufacturing, a UK trade association, and a county police force. 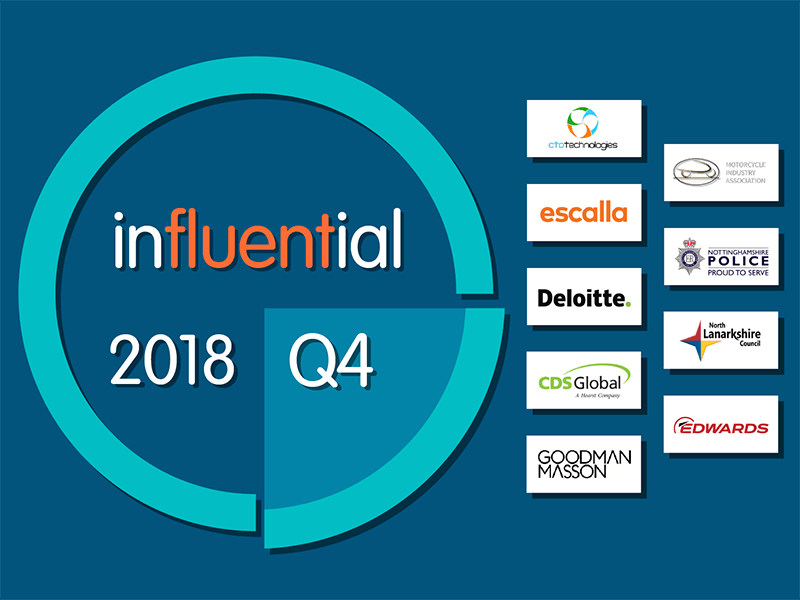 Wrapping Q1, Q2, Q3, and Q4 into one festive package, we see that 34 new clients came to Influential Software in 2018. From energy to property, retail to finance, and government to education, our team has made a tangible difference to UK organisations this year. Strategic partnerships with vendors such as Dell Boomi, Adaptive Insights, Metalogix, and HULFT have strengthened our skills this year. Clients have drawn on the full range of our services, including website development, integration, support, licence sales, consulting, migration, and training. If you’re considering the next step in your digital transformation, it’s easy to find out what you can achieve with Influential Software. North Lanarkshire Council is a local council in southern Scotland, bordering the city of Glasgow. The county has an area of 470 kilometres squared, and had a population of 338,260 in 2015. The council is responsible for management of all services in the local area, including housing, education, business, transport, health, and social care. This client benefitted from Influential Software’s expertise in all aspects of business intelligence, as well as our decades of experience with public sector clients. CTO Technologies is an IT services company based in South East England. The company’s services include consulting, managed services, workspace virtualisation, cyber security, infrastructure services, and licence optimisation. By choosing Influential Software to assist with a software project, CTO Technologies drew on the range of skills and technologies within our 80-strong team. escalla is a UK-based provider of IT training, specialising in the skills of Office 365. The company’s services include off-the-shelf e-learning and LMS hosting, training resources, legislative services, and systems integration. When other IT companies come to Influential Software, it shows the value that our services hold in the sector. Deloitte is an international IT and consulting company, incorporating tens of thousands of professional in independent companies worldwide. Deloitte provides for a wide range of sectors with auditing, consulting, financial advice, risk management, tax, and related services. Deloitte sought out Influential Software’s expertise to supplement its operations in the UK. Nottinghamshire police is responsible for law enforcement in Nottinghamshire, an East Midlands county with a population of over 1 million. Around 3,200 officers and staff work on the force, which covers an area of 2,160 square kilometres. Having worked with a great variety of police and emergency services across the country, including City of London Police and Cleveland Fire Brigade, Influential Software was the natural choice for Nottinghamshire Police. CDS Global is a provider of business process solutions across the customer lifecycle. Services encompass customer service, data solutions, e-commerce, mailing, marketing, telemarketing, order management, payment, warehousing, and distribution. CDS Global approached Influential Software for a bespoke project, trusting in the unmatched results that our clients have come to expect. The Motorcycle Industry Association (MCIA) is a trade association representing around 85 percent of motorcycle suppliers in the UK. The MCIA works with the UK government and related organisations to promote the interests of motorcycle manufacturers, importers, and suppliers of accessories and components. Influential Software’s track record with similarly large organisations drew the MCIA to our best-value services. Goodman Masson is a recruitment firm specialising in finance, technology, executive search, and recruitment process outsourcing (RPO). The company has offices in London, Dusseldorf, and New York. Goodman Masson chose Influential Software’s services to ensure a fast, targeted recruitment system for all its UK customers. Edwards Vacuum is a developer and manufacturer of vacuum systems and abatement solutions, as well as providing related services. These systems are used in the manufacturing of technologies such as semiconductors, LEDs, and solar cells, as well as within the steel, pharmaceutical, and chemical industries. Influential Software’s experience of connecting complex systems within the manufacturing industry and beyond was an important factor for Edwards Vacuum. This year has been an excellent one for us and our clients. As a privately owned company based only in the UK, Influential Software strives to serve every customer with the utmost care and attention. 2018 has shown that our services are sorely needed if UK businesses aim to stay competitive. That trend is only going to grow in 2019 – so watch this space! Have you made a New Year’s resolution to transform your business? Ask us for advice today.